Do you love towing a giant trailer? How about having a big trailer just attached with the ball hitch of your tow vehicle? You would definitely fear some serious accident or other mishaps. In order to stay safe, and drive smoothly, you need the best 5th wheel hitch. This hitch is different from typical ball hitch that is present on the rear axle of the vehicle. Rather, we assemble it on the bed of the truck. As a result, the weight of the trailer distributes evenly between the truck cab and rear axle. Due to its different installation process and weight capacity, 5th wheel hitches are used for pulling big trailers. Are you interested in buying one but not sure what is the best 5th wheel hitch? Well, the process is not very easy. There are varieties of 5th wheel hitches present in the market. In order to get the maximum benefit from your hitch, you would need to buy the one that would suit your needs perfectly. We understand your problem. Therefore, we are going to present the top 7 best 5th wheel hitch reviews along with other important aspects. Let’s delve into the details! The secure connection between truck and trailer is the most important benefit that the best 5th wheel hitch can offer you. Unlike ordinary hitches, this one puts trailer’s weight on the top of truck’s rear axle. However, other hitches apply weight behind the bumper of towing vehicle. This method of towing brings a number of benefits. Firstly, it makes your whole setup a safer and easy to maneuver. It can particularly be helpful in the case of emergency breaks and tight turns. The strong connection would prevent road hazards and accidents. Moreover, as 5th wheel hitch holds the stronger part of your vehicle, it has more weight capacity. Unlike other ball hitches, the minimum weight capacity of these hitches starts from 15000 lbs. You can expect the maximum capacity to be near 30000 lbs. All in all, you can expect secure, smooth, and comfortable ride with the best rated 5th wheel hitch. Yet the weight capacity is another significant boon. Because of all these benefits, RVers prefer them for large trailers or RVs. However, they are also suitable for small trailers as well because of their versatile models. The 5th wheel hitches are categorized depending on the size of the truck’s bed that is towing the trailers. We have two major types of 5th wheel hitches, one of them is slider hitches, and the other is fixed position hitches. They both offer a number of benefits. As their name depicts, the slider or sliding hitches are able to slide. They are able to move somewhere between 10 to 15 inches. This sliding attribute helps in preventing your trailer from hitting the truck’s cab. Thus, you can take tight turns easily without any damages. This feature is required for trucks with the bed size of 6.5 feet or less. On the other hand, we have fixed position 5th wheel hitches. They are fixed and cannot move to provide easy turns. Thus, they are used with the roomy truck beds. Why would you prefer them over sliding hitches? People purchase them because of their lower price ranges. They also choose them for their ease of use and no-chucking. Consequently, if you possess a large size truck, it is better to go for fixed position hitch. However, those with small-bed trucks would need sliding hitches. It is rather the standard form of 5th wheel hitches. You can opt this model if you are more interested in standard models. However, it works in the two ways that are front and back. They allow simple pulling of trailers. Unlike 2-way pivot, this model offers four side movements that include sidewise movement as well. The major feature of this model is its ability to freely move the trailer on any type of terrain. They give smooth and easy drive even on rough surfaces. This type of hitch is suitable for those who have gooseneck trailers. These models either contain hitch lock or a pull rite. Few 5th wheel hitches come with universal rails that attach on the truck beds. Those models that contain universal rails means they are able to connect with any type of trucks. However, they would first need to install by drilling holes and performing whole procedure. In 5th wheel hitches, there is an option to choose between single or double jaw models. The single jaw models use one component to hold and lock the kingpin. It offers a secure connection by giving a single component for locking. On the other hand, we have double jaw models. They contain two components for holding and locking the kingpin. Moreover, they give noise-free movement. If you are looking for the best auto sliding fifth wheel hitch, then Demco 8550035 is the right option. It provides pivot head, wrapping jaws, and locking bars to provide a safe and sound ride. The eminent feature of this 5th wheel hitch is its automatic sliding feature. Because of its sliding feature, it becomes suitable for short bed trucks. On taking tight turns, this hitch provides additional clearance of 14 inches. This space prevents a clash of the trailer with the truck. Moreover, as it is automatic, you won’t have to perform any manual sliding on your own. This hitch comes with a unique locking system. It locks the pin box up. All rotation takes place with the help of the head itself, while kingpin stays secured inside the box. This locking attribute eliminates the need of any other lock. It comes with varying height adjustments so you can use it with different trucks containing varying wall heights. Because of its automatic sliding feature, it is suitable for short truck beds. With its variable height adjustments, it can be used with varying trucks of different height. It offers standard performance with its single jaw. The hitch allows smooth drive with its double pivot. This Demco sliding 5th wheel hitch offers a number of amazing features with the automatic sliding being at the top. You can expect it to provide a remarkable locking mechanism, easy maneuverability, height adjustments, and simple installations. Though its price range is bit higher, its durable features worth it all. See automatic sliding hitch to check what Demco has more for you? Reese is a ground-breaking brand for hitching systems. You can trust this 30120 Pro Series fifth wheel for giving some super handy attributes. It provides strong support, simple installation, and easy maneuverability. What else any RVer may want? The heavy-duty 5th wheel hitch from Reese gives a weight capacity of 20,000 lbs. isn’t it quite enough? It provides the tongue weight of 5000 lbs. With this large capacity, you can easily pull big or industrial trailers behind your truck. It comes with the 4-pivot head. With this feature, you can expect it to ride more smoothly on rough surfaces. The 4-pivot head would allow your trailer to move even side by side. This flexibility is particularly helpful when you are towing at narrow or uneven regions. It comes with double jaws. What benefit would it give? It will prevent your hitch from making noise and enhance the maneuverability of your system. It offers variety for its vertical adjustment. You can adjust it between 13 to 17 inches. It can assist you to hook up the trailer with varying height settings. This sturdy unit is able to resist corrosion, rust, and other harmful aspects. Now, you can expect your unit to serve you for years. Moreover, it comes with a wide stance to provide adequate stability. It provides a large weight capacity. It comes with 4-pivot that makes it easy to ride. With its double jaws, it becomes easier to tow on rough terrain. It comes with a rail kit for easier installation. Its different features might feel hard to manage. This Reese 30120 Pro Series hitch is capable of securing the top place for being the best 5th wheel hitch because it is one of the best hitches options for large bed trucks. With its plethora of useful features, it can ensure safe and secure towing experience. The significant attribute of this hitch is its durability and ease of use. It also provides simple ride with its 4 pivot and double jaws. However, there is one shortcoming in this hitch for those with short truck beds. It is the fixed type of 5th wheel hitch, thus there is not an option of sliding it away for tight turns. Visit Reese 30120 to see how this hitch makes RVing the simplest task. CURT is a name almost all RVers are familiar with. The company is known for making some top-notch hitches and 16516 E16 is one of them. It provides a simple mechanism with a smooth ride and secure operation. The weight towing capacity of 16,000 lbs. makes it one of the best fifth wheel hitches for short bed. It means you can carry considerably a large trailer behind you securely. What’s more? It can slide for as much as 12 inches on the truck bed. This attribute offers flexibility while taking tight turns. This universal 5th wheel hitch is capable of installing on standard rails. It means you can use any industry-standard rails for it. This feature brings with it a great deal of convenience. CURT never disappoints when it comes to durability. This 1516 5th wheel hitch comes with carbide powder coating. It offers durability to the hitch’s components. CURT makes coupling very simple. It offers one-handed operation that a single person can easily perform. Along with that, it provides an automatic locking system. Therefore, coupling this hitch is quite effortless. The 4-way pivoting head allows up to 10 degrees of movement. Consequently, you can drive your trailer without bothering the rough terrain. The hitch mount comes with four height adjustment positions. It offers a great amount of versatility to this best 5th wheel slider hitches. As a result, it adapts to the beds of different trucks having various wall heights. With its sliding jaws, you can use it on short bed trucks. It used universal rails for mounting. With its single-handed operation, you can set them up all alone. It comes with five years warranty. The remarkable attributes of this E16 are quality and low price range. It is going to offer almost every feature you would need for a comfy towing experience including durability, maneuverability, height adjustments, and a simple coupling process. Moreover, adequate weight capacity and universal rails are other worth-mentioning features. What is its single-handle mechanism; see CURT E16 in order to know more. If you are planning to tow a really big trailer, then trust B&W Champion. Like the name, this champion would not betray you in any way. You can expect sturdiness, ease of use, and versatility by this sturdy 5th wheel hitch. The towing capacity of this one of the best fifth wheel hitch is 20,000 lbs with the tongue capacity of 5000 lbs. It is capable of pulling this weight securely with its durable construction. Versatility is another recognition point of this B&W hitch. It is capable of converting preexistent gooseneck hitch into the best fifth wheel hitch without performing any specific assembly procedure. The only thing you would need is the Turnover Ball gooseneck hitch. Moreover, it would only take your 10 minutes in exchanging the hitches. This B&W Champion hitch is a very strong product with durable components. This is the reason; we can observe many experts adoring this hitch for their long journeys. Another feature is its noise-free ride. It won’t make your trailer-truck setup produce annoying sounds. Rather, it comes with double jaws that would wrap the kingpin. Consequently, you would get a nice ride with no sounds or difficult turning. This hitch also comes with cam-action latching handle. This attribute makes it very simple to unhitch the trailer. It even assists at scenarios when you are not standing on a plain surface. This B&W hitch also contains a fully articulated head. It lets trailer move in all direction i-e front, back, and side to side. This feature is very helpful for those who have to go on difficult paths with tight turns. With its wide stance, it offers significant stability. With its rugged construction, it is perfectly suitable for off-road traveling. Due to its cam-action handle, the coupling process becomes easier. B&W RVK3500 Hitch is truly a champion. It not only offers versatility to switch between hitches, but it is very sturdy and reliable product. The ease of use, quiet and smooth rides is its other remarkable benefits. It is because of all these eminent features, professionals take its name when they are asked, what is the best fifth wheel hitch? What else the Champion has to offer you? Check B&W Champion. Expect simple operation and ease of use from CURT’s Q series. Its great towing capacity, smooth ride, and durability is what CURT provides in all its hitches. The load carrying capacity of this Q25 5th wheel hitch is 25,000 lbs. It is significantly great for pulling large trailers safely. This CURT Q25 contains spherical axial bearing. This attribute allows hitch’s head to move in any direction. It results in smooth and noise free ride. Furthermore, it enhances the lifetime of your hitch by protecting it against any kind of impact while turning. This Q25 brings with it wide and self-aligning head. It assists in making the coupling process simpler. 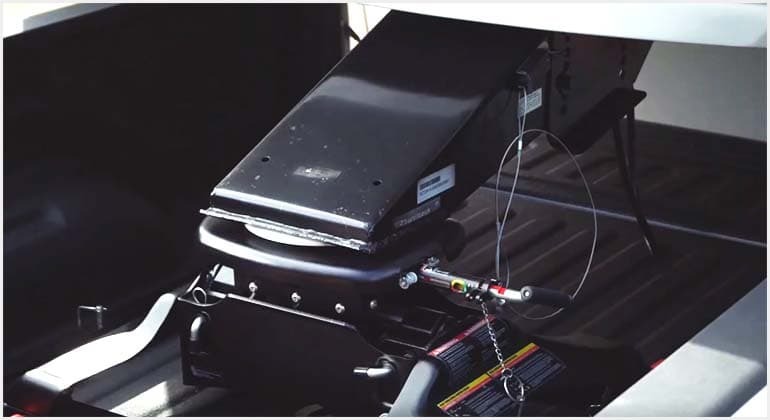 Its automatic functioning prevents any possible chances of mistakes when you are backing up your trailer. Another worth mentioning feature of this hitch is its dual jaws. It completely wraps the kingpin. What’s the benefit? It provides the security and reduces the towing noise. Another worth-mentioning feature of this CURT Q25 hitch is its short throw handle. It is lockable as well. It engages itself with the kingpin automatically. Consequently, the hitching process becomes effortless. Its locking system comes with indicators. These indicators let you know when your trailer is coupled or uncoupled. What would be the benefit? It would prevent any chance of misunderstanding uncoupled trailer as coupled. Beside another easy coupling mechanism, it comes with three grease fittings. It helps in delivering continuous lubrication for secure hauling. The rubber stoppers provide cushioning to head. In order to bestow the hitch’s components with durability, CURT adds a carbide black powder coating on them. It not only provides protection against rust and corrosion but also against UV. Therefore, you can expect service of the long time period from your CURT 16049. It offers large towing capacity. With its spherical bearing, it can tilt in any direction. Its self-aligning head makes coupling easier. Its height adjustments are not able to cover all types of trucks. This CURT’s Q25 16049 hitch is considered as one of the best 5th wheel hitches by professionals due to its big towing capacity at an affordable price. Besides, it offers a very simple coupling procedure. Along with that, it gives a quiet ride and simple maneuverability. Interested to know more about this incredible hitch, visit CURT Q25. Are you looking for best gooseneck hitch? Andersen Hitches has 3220 for you. What’s the most useful thing about it? It is super light in weight. This means a single person is capable of installing it properly. It also offers a number of remarkable features. The heavy towing capacity of 24,000 lbs makes this hitch one of the best 5th wheel hitch for short truck bed. Its tongue weights 4,500 lbs. Therefore, you can trust this hitch for pulling your whole luxurious home with you. This 5th wheel hitch is very versatile. Unlike other hitches, it would allow you to connect with any truck type. As a result, if you have a standard, short bed, or long bed truck, you are good to go. This versatile hitch will work with all of them. You might feel irritated by handling couplers full of grease. Well, this hitch won’t ask you to go through this trauma. The ball of the hitch goes inside the coupler leaving you free from handling it. Moreover, as the coupler sits over the ball, it becomes able to move in any direction without stressing out the connection. What’s more? It comes with three different height adjustments. The lower position is 16-3/4, the middle one is 17-7/8, and the upper height is 19-1/8 so you can attach trucks with different heights. Another remarkable feature of this hitch is its simple assembly. Firstly, it is light in weight. As a consequence, it becomes very easy to place it over the truck bed. Even a single person is enough to perform the whole procedure. Secondly, its new-ball funnel offers very simple hook-up process. The complete installation process would only take 5 minutes at maximum. Unlike other hitches, it doesn’t contain multiple components to slide against each other. Rather, its simple ball mount hook-up makes your ride very smooth and noise-free. This hitch is quite affordable. It possesses a large weight capacity. It offers different height adjustments. With its ball mount assembly, it allows free movement and smooth ride. Its release cable is very fragile. This Andersen Hitches 3220 is a super versatile product. It not only fits on your short bed truck but on long and standard bed trucks as well. Can you expect this flexibility from other hitches? It also allows you to spare up your truck bed from hitch setup whenever you want for the full access. However, its cable might become its shortcoming, as it is very delicate. Visit user-friendly hitch to know how Andersen 3220 provides easy assembly. Looking for some big capacity hitch at an affordable price range? Grab this strong Pro Series 20k Fifth Wheel Hitch. With its secure connection and versatile features, it possesses all equipment to gear up your comfy journey. If you are keen to buy a hitch who actually values your money, then this Pro Series hitch is the answer. It is not only quite nominal in price, but also remarkable sturdiness and weight capacity. It can tow the weight of up to 20,000 lbs. with the 5,000 lbs. tongue weight. This hitch comes with dual jaws system. This attribute assists in securing the kingpins properly. It gives a reliable connection while decreasing the impacts on the hitch and pin. Consequently, you can expect you valuable to stay with you for decades. Moreover, it helps in providing a smooth ride. Another worth-mentioning feature of this hitch is its floating head with 4-ways pivot. This attribute provides free movement to the pin. In the result, it can move in all possible direction resulting in the flawless towing experience. It further provides an easy hook-up process. This Pro Series 20k fifth wheel hitch comes with different height adjustments. What’s the benefit? It allows the hitch to hook-up with different types of trailers having varying height. It provides sound grip on the hitch handle. It assists in carrying out comfortable coupling procedure. Moreover, the locks on its jaws make the process even easier. Moreover, you can secure your hitch by locking the padlock on a tab attached to the jaw. Dual jaws decrease the wear on kingpin and hitch. Because of its adjustable height, you can use it with different trailers. It comes with 10 years limited warranty. You would need to purchase the rail kit separately. The most remarkable aspect of this Pro Series hitch is its affordability. What else? Its big weight capacity and numbers of versatile features make it one of the best 5th wheel hitches in our list. It gives locking mechanism, easy assembly, height adjustments, smooth, and quiet ride. However, you wouldn’t get its rail kit along with the hitch. You would have to buy it separately. Otherwise, it is a very valuable hitch. Visit 20k hitch to know how can you lock it? It is very tricky to buy big items. However, it can become even more challenging when you are unaware of the product. How are you going to select the right 5th wheel hitch when you don’t even know what features to look for? The weight capacity of your 5th wheel hitch is the most important factor that you should consider before purchasing it. It is because the weight capacity refers to the power of your hitch. It is the deciding factor that if your hitch is capable of towing your trailer or not. If you opt for a hitch with a smaller weight capacity, it will not be able to perform its job. Consequently, you might face some hazardous accident. In order to prevent such mishaps, you should go for hitches with equal or more weight capacity. Usually, manufacturers label the weight capacity of hitches on them. You should consider the proper trailer weight including fuel in order to purchase right hitch type. Once you have decided the weight capacity, the next important factor is the type of 5th wheel hitch. It is either a fixed position or sliding hitches. The sliding hitches are able to slide trailer a few inches away in order to provide clearance. This feature helps when you have to take tight turns. The sliding hitches are particularly useful for short bed trucks in which there is low space for taking secure turns. Thus, if you have a short bed truck, a sliding hitch might be a good option. However, if your truck bed is large, stick to the fixed position hitches. It is because they are more reliable/secure and don’t produce any noise. For sliding hitches, you can either go with the manual or automatic sliding option. It is another consideration point that you might consider while searching for the right type of 5th wheel hitch. Both hitches attach to the bed of the truck. However, the gooseneck hitch uses coupler and ball mount to attach the trailer, and 5th wheel uses the kingpin and the pin receiver. There are different mounting options for gooseneck hitches. If you opt for under-bed mounting, then you can easily spare your truck bed for other uses. However, in the case of the above-bed mount, as 5th wheel hitches mount, it would be convenient to switch between two hitches type. It would be helpful in case when you have different trailers. Pivot system makes your trailer flexible. It makes moving on rough terrain easier. However, there are two types of pivot system. One of them is a 2-pivot system, and the other one is the 4-pivot system. The 2-pivot system assists in easy dragging of your trailer. However, the 4-pivot helps in moving the trailer in all possible direction. Besides dragging the trailer, it allows sideward movement as well. This attribute can assist you to travel easily even at narrow and bumpy paths. You should also consider the jaws type of your hitches, as they would affect the quality of your ride. There are two jaws types. One of them is single and the other one is double jaws. Experts say single jaw option is suitable for trailers having more than 25k lbs. weight. It provides a single component for locking the kingpin. It provides a secure connection and amazing performance. The double jaws are also a good option. They use two jaws for wrapping the kingpin. They deliver noiseless ride with easy movement. It is also important to consider the mounting mechanism of you hitch before you purchase it. Normally, 5th wheel hitches use rails system to mount on the truck bed. However, there are other models that come with under-bed and over-bed mounting mechanism. In the first one, all hardware goes under the bed of the truck. In case you don’t need your hitch, you can take hitch out leaving the bed free behind. This is not the case with the over-bed mounting system. On removing your hitch, the basic hardware would stay behind. It might create an obstacle on your truck bed. It is very important to look for this aspect as well. It is because establishing a hitch connection is not a very simple task. In order to ensure easy installation of your 5th wheel hitch, check for your truck and trailer model. If the hitch matches with both, hooking them up would be the simpler task. Moreover, it is also important to check for all the important accessories that you would need for installation. You should get the kit from the manufacturers. You should thoroughly look for assembly and removal procedure. It should be simple and convenient. Your 5th wheel hitch is going to cost you a big amount. It is therefore very important to take proper measures for its maintenance. Before purchasing your hitch, you should check the amount of maintenance it would need. First, of all, your 5th wheel hitch needs proper lubrication. The different components of trailer and hitch slide against each other. If there will be no proper lubrication, it might end up into damaged parts. Therefore, you should keep lubricating them in order to ensure their good condition. In order to lubricate them, check all moving parts. Carefully grease them using an automatic grease gun. You should go for high-quality lubricator. Moreover, it is advisable to remove previously present lubrication on these parts. 5th wheel hitches also face rust issues. It is also important to apply rust converter as soon as you detect rust on them. It is a very crucial additional item you would need with your 5th wheel hitches. It may include plug adapters and others. As it names says, it prevents the trailer from falling on your truck bed. In case, your 5th wheel detaches the trailer, the bed saver would hold it preventing your truck bed. It would assist in adding additional space to the kingpin size. Thus, there will be more clearance space. The last but not the least point to consider before purchasing the hitch is its manufacturer and price. The makers of the product say a lot about the product. Thus, it is very important to opt for reputable manufacturers. Few of them are CURT, Andersen, and others. The price range of the hitch depends on your budget. You can evaluate it to see how many features you can afford. Typically the low range of hitches goes somewhere between $300 and $500. On the other hand, the high-profile hitch may cost around $2500. Can I put a 5th wheel hitch in a short bed truck? Whether you can put a 5th wheel hitch in a short bed truck or not, depends on your hitch. It is because short bed truck comes with certain requirements. The important issue that your short truck can impose is while taking tight turns. In order to cope with this problem, you can opt for certain types of hitches named as sliding hitches. These types of hitches allow taking safe tight turns even with the short bed trucks. Moreover, there are few gooseneck hitches are also available that works well with the short bed trucks. However, note that, by shorter we mean, a bed truck with 6.5 feet long or shorter. Is a fifth wheel hitch removable? Yes, fifth wheel hitches are removable. However, you won’t be able to take out the whole setup out of your truck. The rails mounts might stay fixed on their place. This thing can slightly disturb you when you would need your truck bed for other purposes. Here, also facts depend on the type of hitches. There are few like B&W Champion, that doesn’t cause this inconvenience. On removing them, they do not leave any of their spare parts behind. Thus, you can get full access to your truck’s bed. The 5th wheel hitches are great types of hitches to pull big trailers. They are very strong and stable. It is because they fix on truck’s bed instead of its rear axle. In this way, they divide the weight equally and prevent issues you might face with typical ball mounts. They also offer more free movement for taking sharp turns. In order to help you out, we have reviewed the best 5th wheel hitches in detail. Moreover, the supporting knowledge and buying guide is also provided in detail. Thus, you can choose for the right type of hitch easily. In our recommended product, you can see a variety of hitches. They all are functional to a great extent. However, they are meant for different purposes. There are wide varieties of 5th wheel hitches available in the market. If you want your towing experience to be successful, you should purchase the right type of hitch. Define your purpose and then match with our product features to choose the best one. The best hitch would be one that suits your requirements and matches your trailer. Only then, you can get the maximum benefit of a 5th wheel hitch – that is to provide effortless driving experience with a secure connection.